There are numerous Friesian registries -- several purebred registries and around seven cross-breed registries in the U.S. alone. One regional organization for Friesians has a great discussion of the main registries. I was astounded at the number of purebred and part-bred registries for Friesians. It seems that the term "Friesian Sport Horse" is used for Friesian crosses. Some registries are spin-offs from older registries and I'm betting it was the result of differing opinions on the issue of cross breeding (See Northeast Friesian Horse Club page for more). At any rate, here are the registries I read about, with the standard disclaimer that I'm not a Friesian expert. Koninklijk Friesch Paarden-Stamboek (KFPS): Established in 1879, the KFPS not only promotes purebred breeding, they disallow cross breeding of approved Friesian breedng stock. Only 100 stallions are approved worldwide, with about 20 in the U.S., including the Friesians of Iron Spring Farm. The Friesian Horse Association of North America is affiliated with the KFPS. Friesen Pferde Zucht Verband (FPZV): FPZV split off from KFPS in the early '90s to set its own regulations; it is not endorsed by KFPS. The registry itself is purebred but FPZV permits cross breeding. Friesian Horse Society (FHS): This sport horse registry split off from FPZV; it includes purebred and cross bred horses. Friesian Sporthorse Association: This registry was featured in an article in USDF Connection. According to the association, it is "the first and only registry dedicated exclusively to true Friesian Sporthorses. Unlike most of the Friesian cross registries, the FSA is actually structured as a true breed registry, with strict and specific guidelines for registration and breeding." Friesians of America (FOA): it's mentioned a lot on breeder pages, but the FOA Web site does not seem to be available any more. Crossbreed registries: There are tons of them, including the Fresian Sport Horse Registry; the Moriesian Registry (registers Morgan/Friesians); the Warlander registry (registers Andalusian/Frieisans); the Georgian Grande registry (registers Saddlebred/Friesians and Saddlebred/Drafts); the Friesian Blood Horse; the International Friesian Cross Association; the Friesian Heritage Sport Horse; and probably more. I LOVE Friesians! I never knew there were so many registries though! I too first fell in love with Goliath from Ladyhawke. Love that movie! 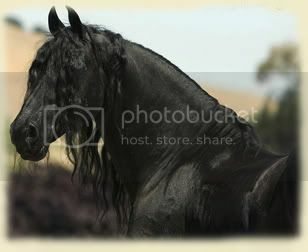 The Friesian has also been the horse of choice for Antonio Banderas in The Mask of Zorro and The Legend of Zorro. Friesians have been featured in Tall Tale, Les Visiteurs (Die Besucher), Black Knight (Ritter Jamal), Sleepy Hollow (Christopher Walken), Last Action Hero, Alexander the Great, 300, The Young Black Stallion (Prequel), Running Free, King Arthur (F. with white socks), Eragon, and Sense and Sensibility. Friesians are soooo BEAUTIFUL! I really miss having my horses.... Someday I hope to have one again.